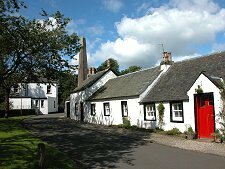 Killearn is a picture-postcard village lying at the foot of the north west slopes of the Campsie Fells. The A81 north from Glasgow passes a mile or so west of Killearn, effectively bypassing both it and Balfron to its north. This helps add further to its already considerable attractions. 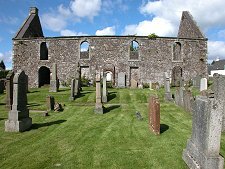 Killearn itself is laid out on a hilly site and comes complete with no fewer than four churches or ex-churches. It also has a rather unexpected monument in its centre, the 31m high Buchanan Monument. This sits in a railed enclosure just opposite the Black Bull Hotel and would be grand in any setting. Here, in the fairly intimate heart of the village, its effect is very striking. 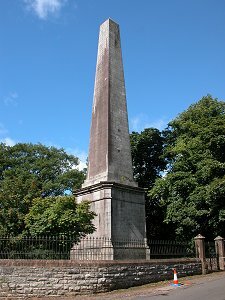 The monument was erected by public subscription in 1789 to celebrate the fact that Killearn was the birthplace in 1506 of George Buchanan, the renowned scholar. It was designed by the Edinburgh architect James Craig, who gave his services free to the project. The marble tablet now found on the north side of the base was added during restoration of the monument in 1850. A little to the north of the monument is Killearn Parish Church. This was built in 1882, financed by Archibald Orr Ewing in memory of his daughter Ella, who had died in 1878 at the age of 16. 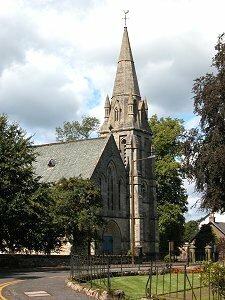 Whether Killearn actually needed a new parish church at that point seems debatable, as still standing immediately to the north of the Parish Church is the Former Parish Church, built in 1826. This now serves as the village hall. A little to the south of the Black Bull and the Buchanan Monument are the roofless remains of the Old Church. This was built in 1734 before being made redundant by the 1826 church. In the 1800s the Old Church was used as a burial enclosure and amongst those buried here was Ella Orr Ewing, in whose memory the current Parish Church was built. Opposite the Old Church are a line of white cottages known as The Square. These were built in the late 1700s, and restored in the 1930s by the Killearn Welfare Trust. 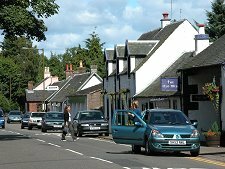 Killearn is not just bypassed by the main road crossing the area, it was also bypassed in the 1800s by the railway, which ran along the valley of the Blane Water a mile or so west of the village. 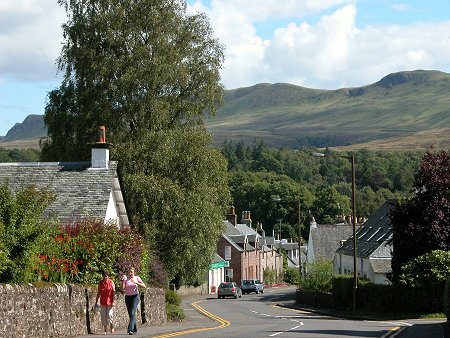 The railway is long gone, but its track is today used as part of the West Highland Way, meaning that walkers following its course also miss out on seeing this lovely village. 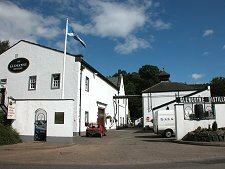 Two miles south of Killearn is Glengoyne Distillery. This is one of a number in Scotland to declare themselves the country's "most beautiful": but whatever the competing claims it certainly is exceptionally attractive. Glengoyne lies right at the very foot of the Campsies and when it was built in 1833 it was called Glenguin, or "Glen of the Wild Geese". However, English tongues were too ready to pronounce the name to rhyme with "penguin", so it was changed to Glengoyne in about 1900.